A West Virginia high-school student analyzing data from the GBT has discovered a new rotating radio transient, a pulsar-like neutron star, and the feat won him a trip to the White House. Lucas Bolyard, a sophomore at South Harrison High School in Clarksburg, WV, made the discovery while participating in the Pulsar Search Collaboratory (PSC), a joint project of the NRAO and West Virginia University, funded by a grant from the National Science Foundation. 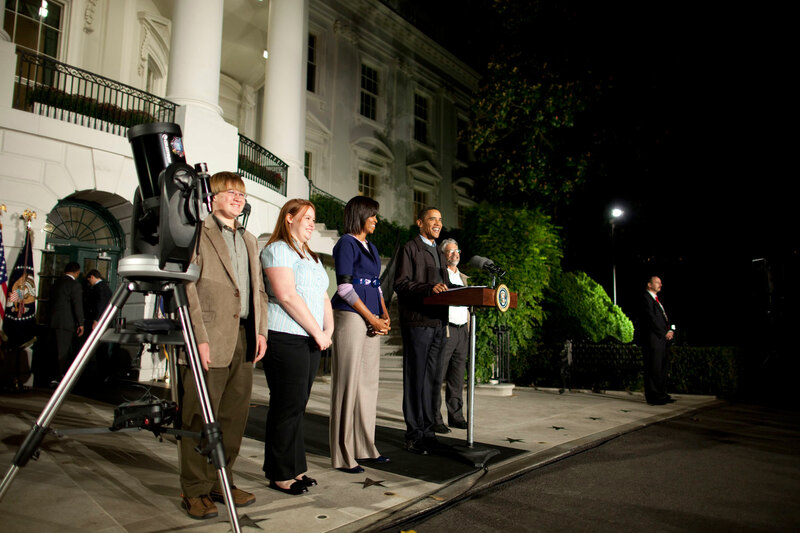 His discovery was announced in September, and as a result, Bolyard was a guest of honor at the White House Star Party the evening of October 7. 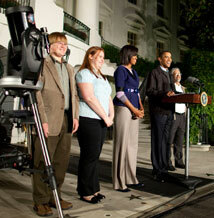 President Obama, in his opening remarks at the star party, introduced Bolyard, who was standing next to the podium. Bolyard made his discovery in March, after he already had studied more than 2,000 data plots from the GBT and found nothing. "I was home on a weekend and had nothing to do, so I decided to look at some more plots from the GBT," he said. "I saw a plot with a pulse, but there was a lot of radio interference, too. The pulse almost got dismissed as interference," he added. Nonetheless, he reported it, and it went on a list of candidates for West Virginia University astronomers Maura McLaughlin and Duncan Lorimer to re-examine, scheduling new observations of the region of sky from which the pulse came. Disappointingly, the follow-up observations showed nothing, indicating that the object was not a normal pulsar. However, the astronomers explained to Bolyard that his pulse still might have come from a rotating radio transient. Confirmation didn't come until July. Bolyard was at the NRAO - Green Bank with fellow PSC students. The night before, the group had been observing with the GBT in the wee hours, and all were very tired. Then Lorimer showed Bolyard a new plot of his pulse, reprocessed from raw data, indicating that it is real, not interference, and that Bolyard is likely the discoverer of one of only about 30 rotating radio transients known. Suddenly, Bolyard said, he wasn't tired anymore. "That news made me full of energy," he exclaimed. Rotating radio transients are thought to be similar to pulsars, but instead of continuously emitting, they emit only sporadically, one burst at a time, with as much as several hours between bursts. Because of this, they are difficult to discover and observe, with the first one only discovered in 2006. "These objects are very interesting, both by themselves and for what they tell us about neutron stars and supernovae," McLaughlin said. "We don't know what makes them different from pulsars -- why they turn on and off. If we answer that question, it's likely to tell us something new about the environments of pulsars and their emission mechanisms," she added. The PSC, led by NRAO Education Officer Sue Ann Heatherly and Project Director Rachel Rosen, includes training for teachers and student leaders, and provides parcels of data from the GBT to student teams. The project involves teachers and students in helping astronomers analyze data from 1500 hours of observing with the GBT. The 120 terabytes of data were produced by 70,000 individual pointings of the GBT. Some 300 hours of the observing data were reserved for analysis by student teams.